Race still plays a defining role in a person’s life trajectory, experiences, and outcomes. Shifting demographics make even more urgent our need to speak openly about racial bias and inequity, and their deep roots in our history, culture and institutions. However, when race enters our public conversations about important national issues, the dialogue is too often dehumanizing and racially charged. It too often focuses exclusively on racism at the level of the individual, dismisses systemic racism, or refers to racism in the past tense. This kind of reporting leaves out important contextual information such as the role of history, institutional policies, and inequitable practices, and it very rarely features prominent, robust coverage of solutions. We need more tools to move our race conversations forward in more accurate, fair, and productive ways. 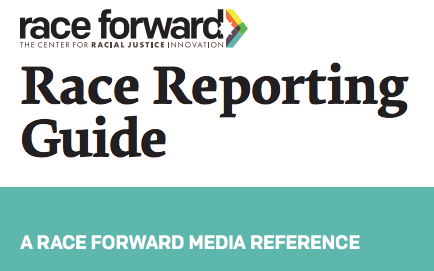 Race Forward’s Race Reporting Guide aims to provide critical support for the use of responsible language and story framing that reflects ethical and rigorous journalistic standards and affirms the dignity and human rights of people of all races. This is not meant to be comprehensive, or to reflect all perspectives and important thinking that has been done on these issues. The Guide serves as a tool for journalists and thought leaders in the U.S. talking about race, racism, and racial justice in the media by providing context and guidelines to inform reporting and language, and to encourage more conversation and understanding. Questions and suggestions related to this guide are welcome, and we invite journalists and media-makers to consider Race Forward a resource in story-development, experts available, and talking about race in the media. Contact us at media@raceforward.org.